Does anyone get dressed up for Thanksgiving? 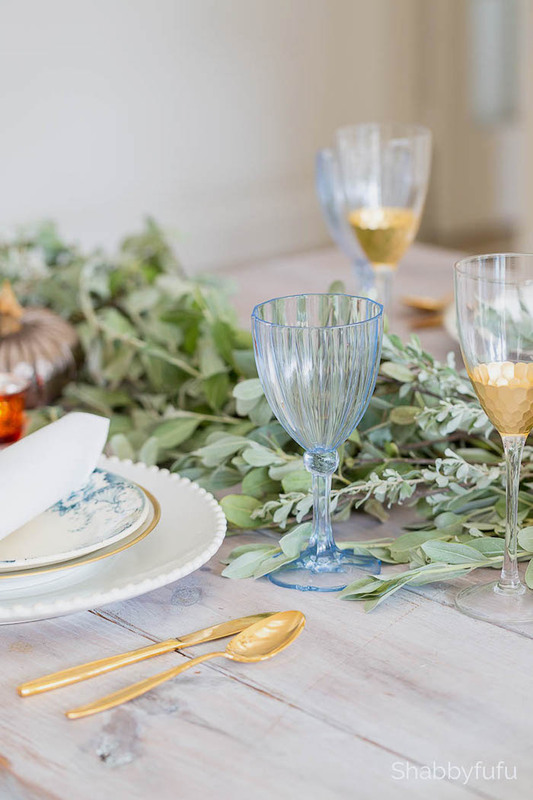 In our family, while other occasions bring out our holiday finest, Thanksgiving invites cozy sweaters, jeans and other casual fare. The focus is on family and the feeling is warm and grateful. So, of course, I like my table decor to reflect this same attitude. 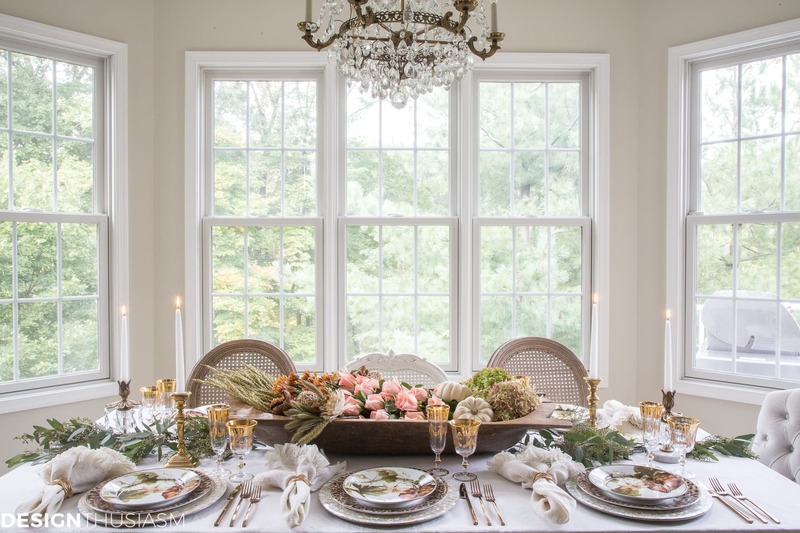 Today I’m joining with 5 other bloggers to bring you Day 2 of the Styled + Set Fall Entertaining Blog Hop. If you’re coming over from Craftberry Bush and are new to my blog, let me extend a special welcome! And to everyone, be sure to enjoy the other gorgeous posts linked at the bottom of this page. 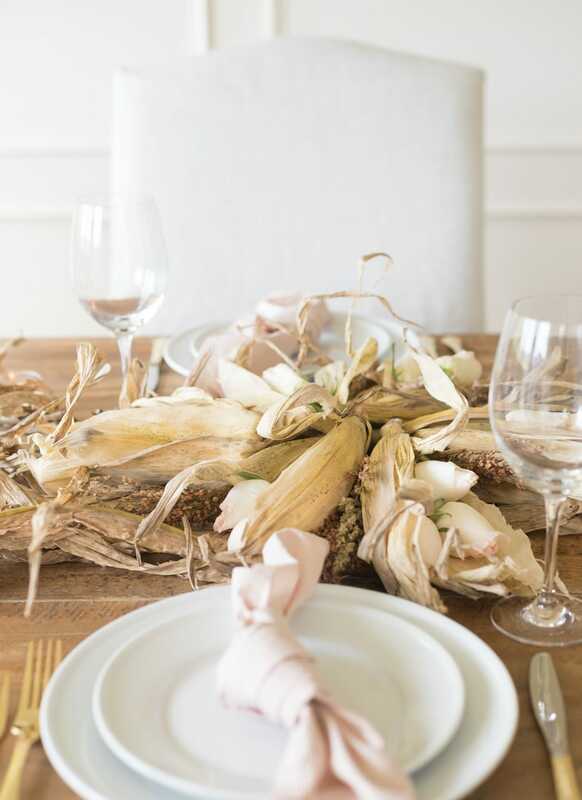 Before I get to the centerpiece at the heart of this tablescape, let’s take a look at the place settings around it. 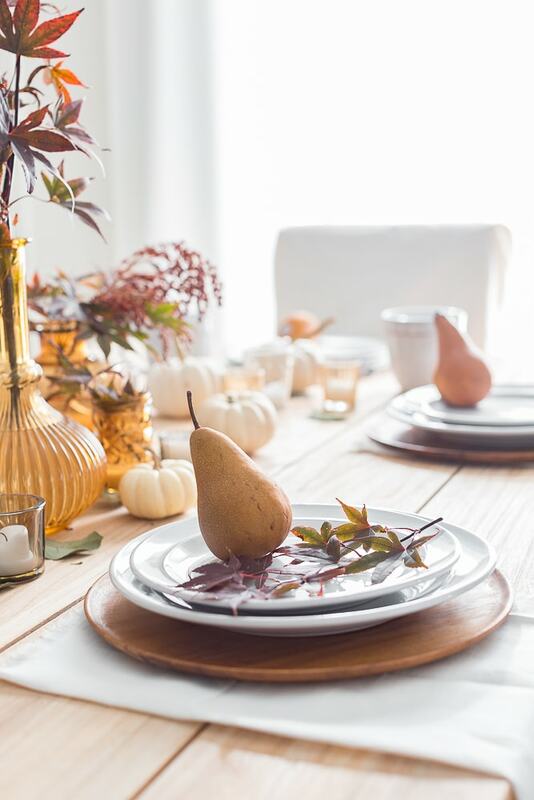 I love to start with my favorite seasonal salad plates, but try to make them look different each time I use them. This time I paired them with animal print dinner plates and placed both atop chargers of mother-of-pearl mosaic. 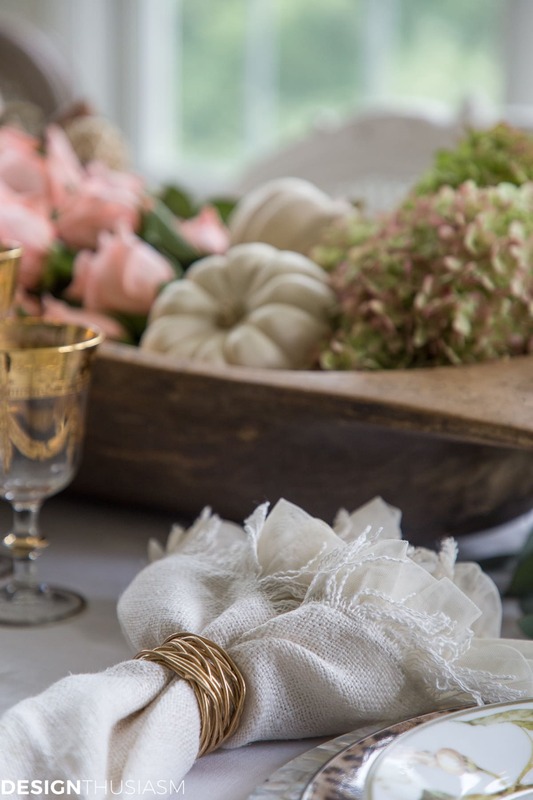 I’m loving these fabulous rugged linen napkins, edged with fringe and a delicate sheer ruffle. The napkins alone embody my concept, mixing casual with elegance all in one piece. To support the theme of warmth I’ve used gold trim throughout, including these napkin rings encircling the linen. 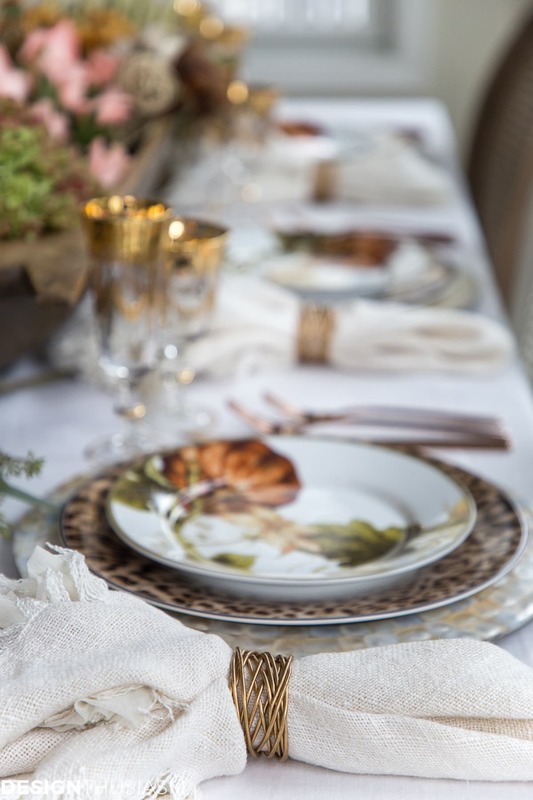 In addition to gold, I used touches of copper, primarily in the flatware adjacent to the patterned plates. This is the closest that I come to using traditional fall colors, with gold, cream and copper imparting that spectrum. 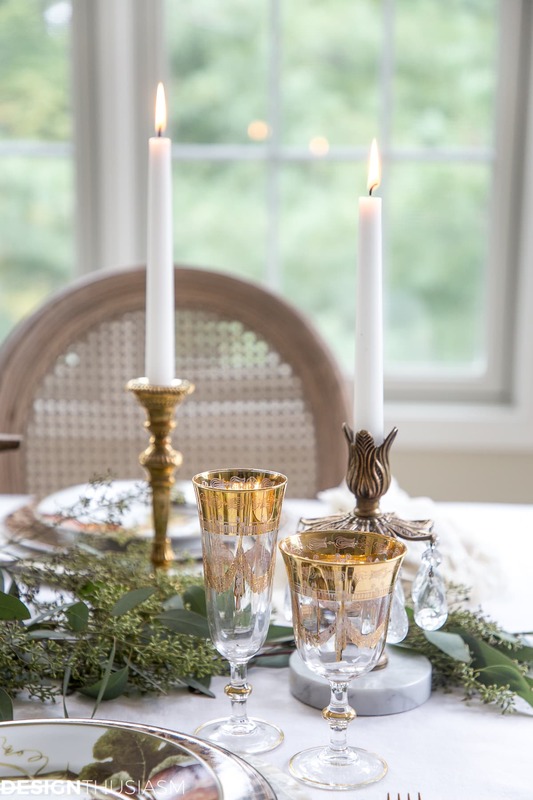 For stemware I used these exquisite gold trimmed goblets, which add a note of “holiday special” to a table that’s otherwise very casual. They’re the pearls you wear with your sweater and jeans! 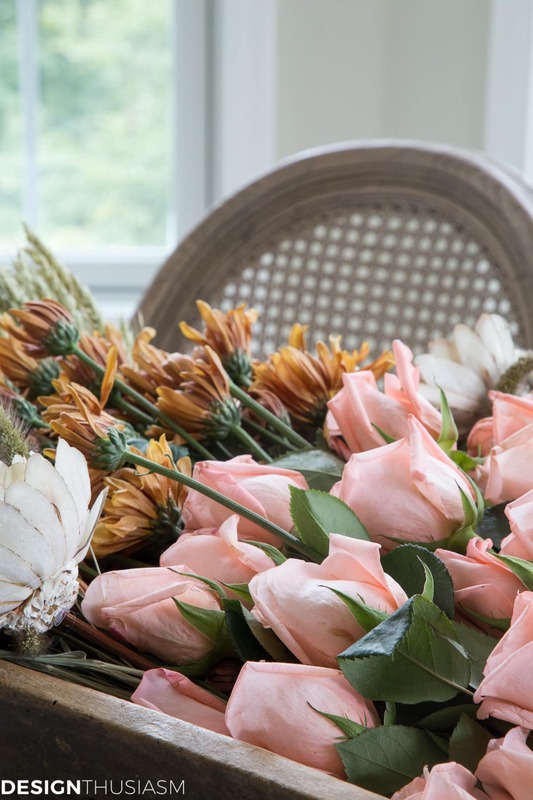 Which brings us to the star of this table, the bountiful dough bowl that’s brimming with flowers. 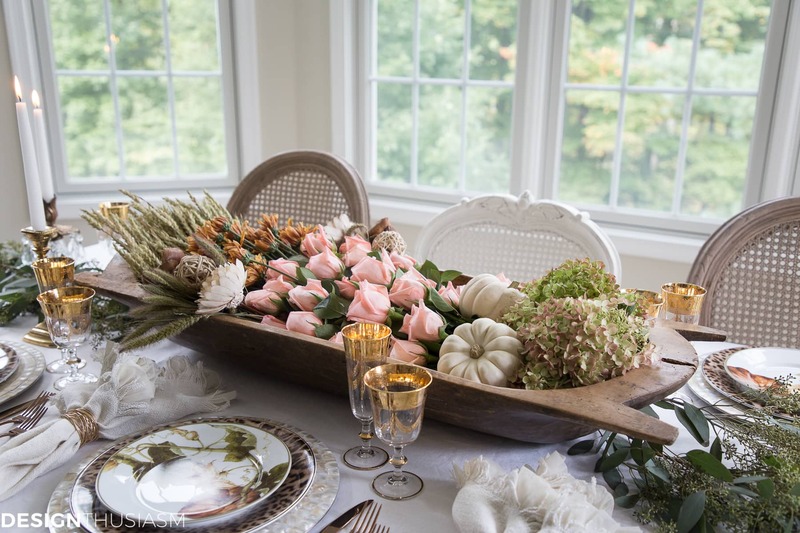 Perhaps you’ve seen me do this in the past with spring blooms, but fall centerpieces require a very different palette. I used wheat stalks and mums, hydrangeas and baby boos. But I always need to add in a dash of pink, too. Here I went with coral pink roses to add that feminine twist that’s emblematic of my style. Finally, I draped seeded eucalyptus as a table runner and interspersed candlesticks in vintage brass. Thanksgiving has always been my favorite holiday, family centered and celebrating gratitude. These values warrant a warm and lovely setting, but relaxed and casual is the order of the day. 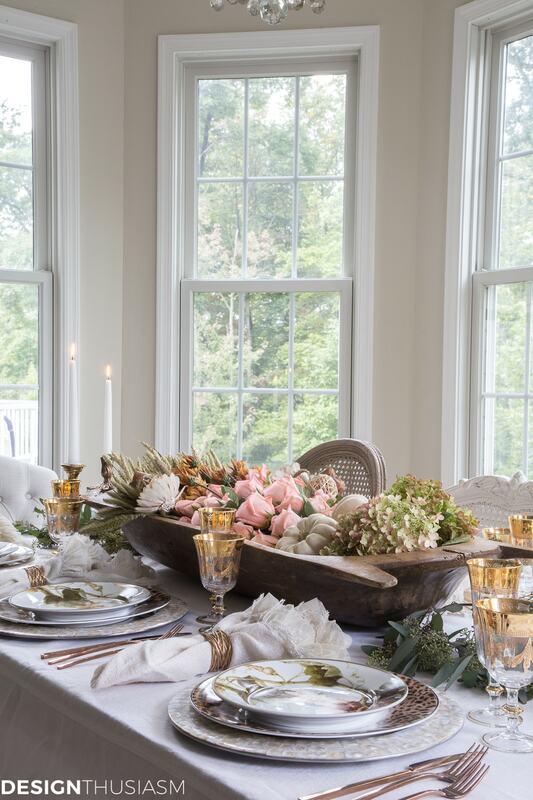 The day is best spent in the company of loved ones and my table is set to welcome them home! 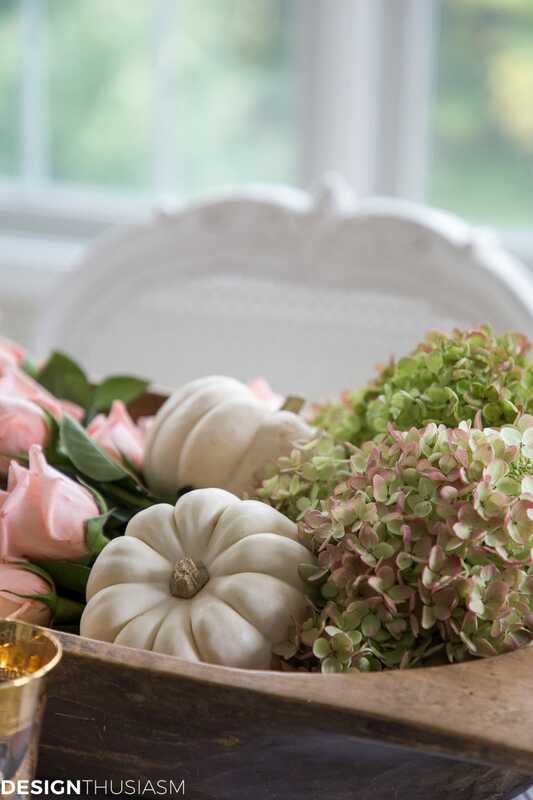 Fall Centerpieces Source List – To get the look, click on the items below for direct links to the products. Where actual items were no longer available, I’ve provided similar options. Next up on the tour is my friend Ann from On Sutton Place. 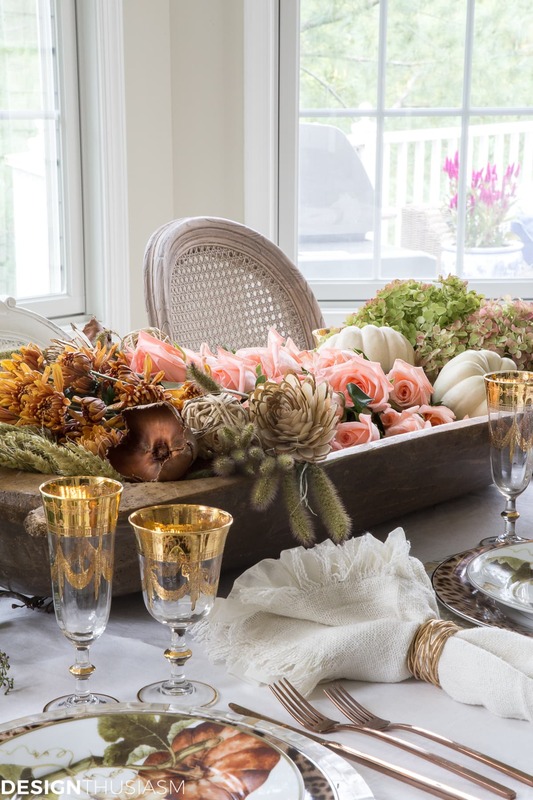 I know you will love her creative take on fall entertaining. Then, please enjoy the rest of today’s posts below! Lory, everything is just so stunning! I love you mixed things up…super cozy and elegant! Lory, finally someone got the placement of the flatware “right.” Since most folks are right handed it makes sense to have the utensils on that side. Your casual is my elegant – very, very gorgeous! Lol, thanks Sharon! You have no idea how much flak I get for doing that from some etiquette sticklers… 😉 But I figure, my table, my rules! Glad you like it!! Thanks for the sweet words, Jean! It’s gorgeous, Lory! 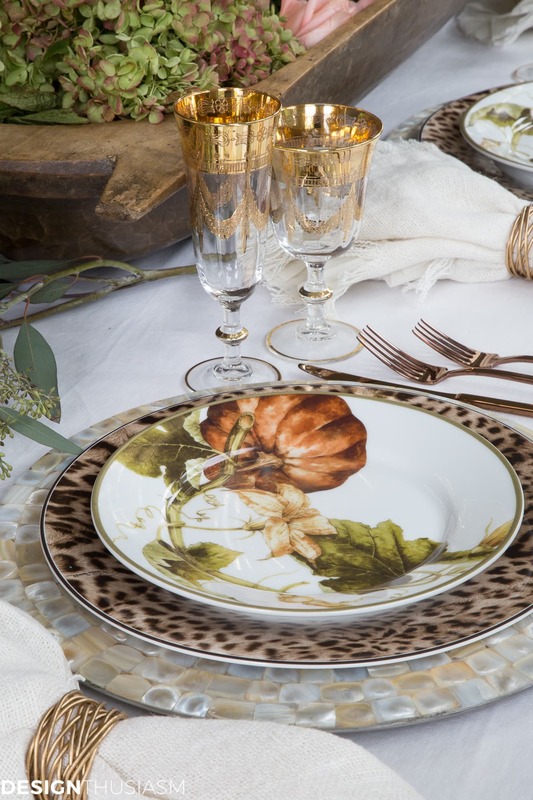 Love the pairing of the salad plates with the animal print plates and mosaic chargers. Unique and pretty! Thank you so much, Jennifer!! I adore this table Lory. 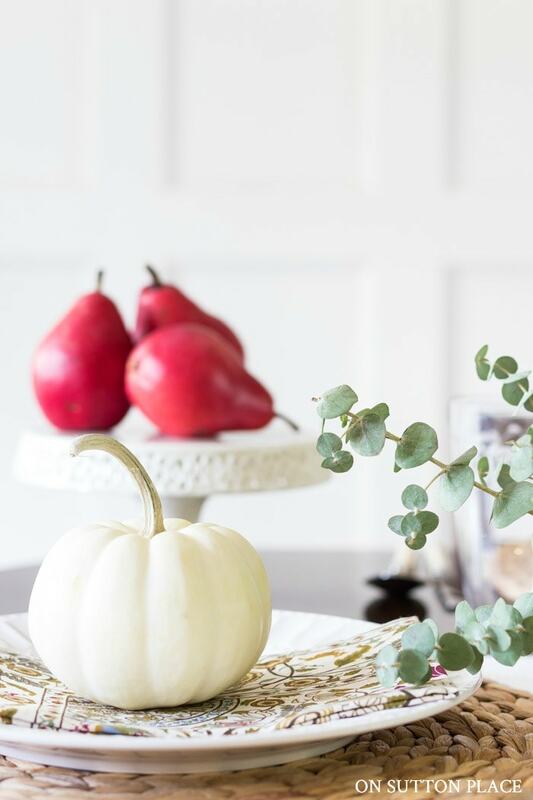 I’ve had my eye on those pumpkin plates for awhile and now I’m thinking I might have to get them! And they look amazing with the leopard – love it! 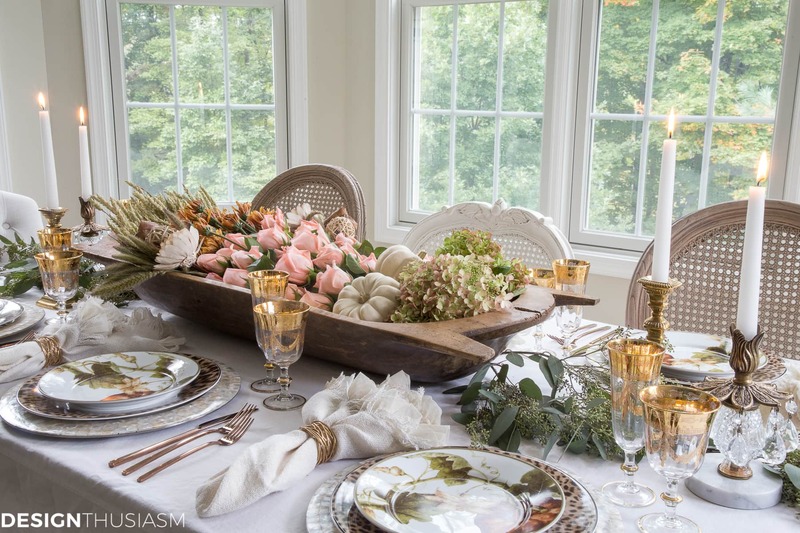 The mix of the casual dough bowl and the very dressy gold is wonderful. Your china is beautiful and I love the splash of pink in the centerpiece! We must be a strange bunch as our family dresses up for this season. Even though it is just the 5 of us ( 7 if you count the dogs that watch the fun ) we find that taking care to dress up brings appreciate to ourselves as well as those that prepared the meal. Lory what an exquisite table setting! I adore the doughbowl cneterpiece and am obsessed with the leopard plates! Thank you so much for including us in this beautiful series with such an amazing group, we really appreciate it! 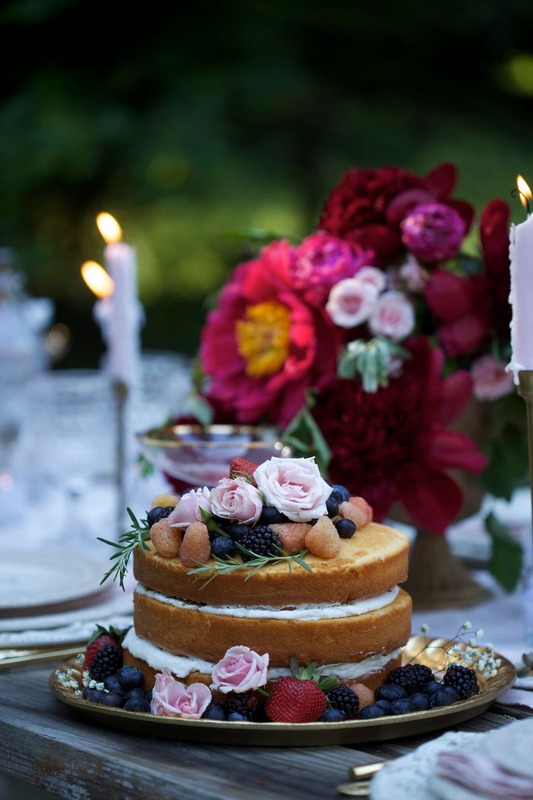 Such a beautiful tablescape, Lory. Thanks for organizing another wonderful tour!